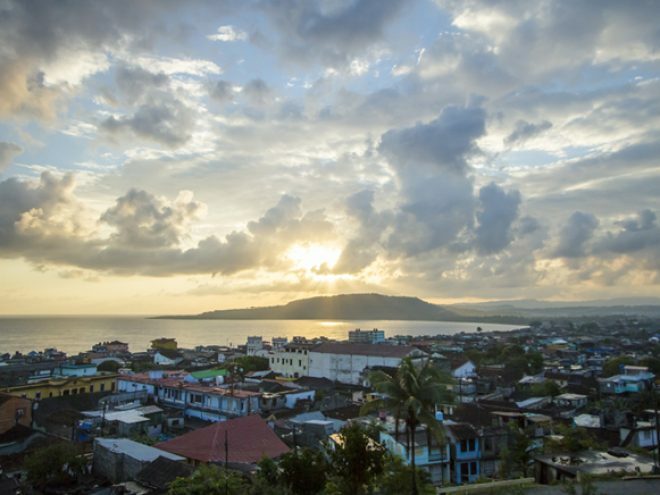 Baracoa was established twenty two years after Columbus first arrived in Cuba. It was the island’s first settlement. Its strategic location demanded towers and fortresses to protect against unfriendly ships at sea and troops on horseback. .. I spent the late afternoon in the small town square, actually a large triangle formally called Plaza Cacique Hatuey, watching and talking. Two girls about ten played chess while a friend kibitzed from the side. Next to them two men in their early twenties played checkers. A young woman in a screened in kiosk sold the provincial daily and Granma, which arrived from Havana by noon every day. Two teenagers played Ping Pong. Four old men surrounded a table playing dominoes; they looked as if they had been sitting in the park since the days when Batista was an army sergeant. From the far end of the plaza, across from a beauty parlor, a twenty five piece municipal woodwind band entertained slowly passing onlookers. When the people of Maisí talk of a nearby bewildering country, they mean Haiti. I wanted to see Maisí, 38 kilometers from Baracoa, at Cuba’s easternmost tip… I set out along a couple of paved roads through small communities outside town, and finally a dirt road. The rainfall that had hampered my drive up the Farola Highway had also laid waste to the Maisí road. Foliage grew thick as the mud we drove through. Between copses of palms and dense jungle shrubbery I could make out occasional bohíos, the thatched homes of the outback. Cuba’s beauty had a soft integrity to it; comforting, almost caressing. The Nissan sloshed forward until the road proved impassable even for first gear. I abandoned the car and walked. Soon I arrived at Abra de Yumurí, a settlement on the banks of the Yumurí River where it spills into the Atlantic. To reach Maisí we would have needed a jeep first to cross a 250-foot wooden bridge spanning the Yumurí, then to climb up a slippery hill. Still, Abra de Yumurí satisfied my search for the end of Cuba. Its one business was the open air Cafetería Yumurí, a bare light bulb hanging over a refrigerator and a rustic stove. Four men played dominoes on the porch. Everyone knew my traveling companion Alejandro Hartman; he was greeted as a benevolent cacique, the local political chieftain who inquires of your welfare and asks about crops. We walked across the bridge. “It’s made of cedar. Its construction shows the French influence in the area.” Canoes were tied to the bridge’s girders. Hartman pointed to a spot just beyond the hill leading up from the river. “When bananas come from Maisí, they’re hauled by mule to a spot over there. Then they’re loaded onto a funicular to the bottom where they’re loaded into boats.” Hartman walked off to talk with someone. All I could hear was the faint clicking of dominoes over the sound of the Yumurí emptying into the Caribbean. A short distance away heavy, dark women in loose dresses folded their bodies over to fill buckets with water from the mouth of the river, much as I suppose women on the shores of other islands throughout the West Indies were doing at that same moment. By the time we meandered back across the bridge, recreational activity had taken a more active turn. The four dominoes players had taken a break, but nearby, on marshland skirting the Caribbean, a dozen energetic boys under ten had started a baseball game. They played with a hard rubber ball and a stick for a bat. They had one glove among them, and an outfield that stretched to the Lesser Antilles. They all wore shorts, a couple had shirts, and one boy wore shoes. On this marvelous makeshift playing field, if you hit Haiti you should get a ground rule double. Once a foul ball popped into the mouth of the Yumurí, to be retrieved by a fully dressed woman up to her waist in the brackish backwater. These were the future stars of the Liga Nacional, and if they were good enough, the Liga Selectiva, and if they were among the best, the national team that plays against other countries abroad. A lefty whacked his first pitch to the edge of Cuba. A barefoot outfielder ran it down among the seashells and tiny rocks in the loamy Caribbean beachfront. The southpaw crossed a pile of shells that doubled as home plate, as an outfielder heaved the ball in from the light blue sea. These kid stars were acting out passion plays with each pitch. Through all the claptrap of baseball diplomacy, defections, and amateur status versus state sponsored athletics, the screams of these dozen happy kids jumping up and down alongside the sea stood out as the most potent, wholesome vision I could take with me. I’ve kept that image in my mind, both the romance and the reality of it, afraid that I’ll never again encounter such unadulterated baseball in my life. Cuba called its economic free-fall following the Soviet Union implosion the “Special Period in a Time of Peace.” Depravations and hardships were prevalent. Blackouts and empty shelves, common. The early 1990s forced the country to severely adapt to major difficulties. Author Tom Miller lived in Havana at the time, and traveled throughout the country. The result was Trading with the Enemy: A Yankee Travels through Castro’s Cuba, which Lonely Planet has said “may just be the best travel book about Cuba ever written.” In this exclusive excerpt adapted from his book, Miller visits the country’s northeast.